Chicago's first two albums were great. Really great.They were one of a few bands that ever broke out with a double album as their first market appearance. After that ... not so sure. Not so strong starting with Chicago III, which was also a double album. The Internet tells us that they then went into a downward spin of sorts, probably related to their [perceived/expected] success and management. The Internet also tells me that Chicago's "If You Leave Me Now" is primarily bass player Peter Cetera's song. There appears to have been some contention within the band/producers at that time related to the softer, more emotional Cetera style as opposed to the harder-driving original Chicago sound (heavier on blaring horns and Kath's guitar). Again, the Internet informs me that Cetera wrote the song around the melody. The song did quite well on the charts, which may have influenced the producers' direction: Cetera's compositions took on a more prominent role after this hit. James William Guercio -the producer - is credited with acoustic lead. Also played bass for the Beach Boys at one time as well as working with Blood, Sweat & Tears. Breakup songs generally sound like they are intended for an audience of one: the person being broken up with. The songs can express anger, heartbreak, or despair. They can express undying devotion, now unrequited. But the goal is often to make the case for why the breakup is happening. In truth, the singer is often trying just as hard to convince themselves that it is over as the current or former object of their affection. Coyote is not a typical breakup song, in that it depicts a relationship that the singer never intended to be permanent. But it shares this element of trying to convince both parties that it is over. This is a relationship that has already lasted longer than the originally intended one night stand. Joni Mitchell’s narrator must have originally intended to be gone the next morning without even a goodbye, and this seems to her to be a normal feature of a life on the road. It is a set of rules she thought both parties understood, but “Coyote” had other ideas. He collects women, and he treats them to a level of passion that draws them back like a moth to a flame. Mitchell’s character mentions that she can not and does not expect faithfulness here, but her main stated reason for going is simply that she belongs on the road, and can not be tied down. She is trying to convince both him and herself that what she would get back for this loss of freedom would not be sufficient compensation. In my description above, I have referred to Joni Mitchell’s narrator. It is curious that the first Joni Mitchell song I thought of for our theme comes from her album Hejira. Mitchell was at this time trying to escape a reputation as a confessional songwriter. Her earlier brilliant relationship songs were certainly about herself, but she had made a break with that mode of lyric writing with her previous album, The Hissing of Summer Lawns. The songs on Hissing are told in the third person. They are stories about characters that Joni Mitchell invented, and they travel in worlds that Joni Mitchell clearly did not. Hejira is a trickier album to pin down. Even though Coyote is told in the first person, Mitchell asked her fans to not assume it was anything she had experienced; in particular, she didn’t want fans to speculate about the identity of any real life Coyote. I am sure they did anyway, and it would be one of the last songs Mitchell would record that could be construed as being about a recent event in her life. Her personal songs from later in her career tend to be about things that happened longer ago, and there are some great songs among them, but there is not the sense of immediacy that fans had come to expect, and that is found in Coyote. When I was a kid, just getting into music, I mostly bought singles, or 45s, as we knew them, for the number of revolutions per minute (RPM) of the turntable, as opposed to LPs, played at 33-1/3 RPM. Some turntables also had a setting for 78, which was for old time records, and therefore was only used to play our stuff fast, making the singers sound like the Chipmunks, as a joke. The 45s had a big hole in the middle, requiring the use of an adapter. Why? This is a question that I have wondered about for decades, and for some reason only decided to Google while writing this post. Turns out, there were both commercial and scientific reason for the big hole, and if you are really interested, click here. In those days, my father would get home from work in the city around dinner time, and in an era of limited TV offerings, after we ate, it was not uncommon for him to come into my room to listen to music with me. As I have noted elsewhere, my father, at that point in his life, was not really interested in rock music—or at least current rock music. He listened mostly to standards and oldies stations that played the doo-wop of his youth. But he was a good dad, and enjoyed spending time with me, listening to whatever I wanted to. We would lay on my bed, listen and talk. When I had kids of my own, I learned that the best way to find out what was going on in your children’s’ life was not to pepper them with questions, but to just talk, and the information would come out. Plus, it led to a strong bond that we maintained throughout his life. I doubt that my father learned this technique from a book; instead, I think it was just a parenting instinct, and it is something that I tried to emulate. Although, to a greater degree than my father, I actually learned to really like some of the music my children exposed me to. 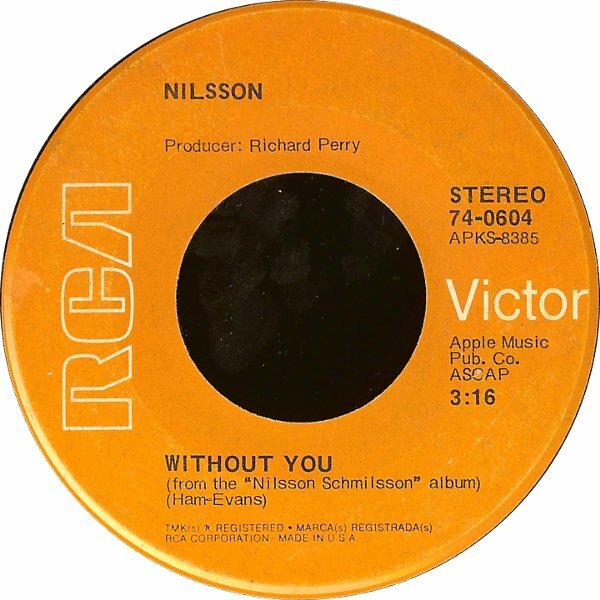 But my father loved Harry Nilsson’s “Without You,” and we would spin my copy of the single (which looked exactly like the one in the picture above) on a regular basis. I remember that at the end, when the song was at its climax, Dad would often say something like, “and now, they are taking Harry Nilsson off the stage in flames,” because of the intense, theatrical emotion of the song. Although it started off with a simple piano backing the vocals, by the end, it sounded like an entire orchestra was playing, and Nilsson was wailing away. We were not the only ones who loved the song—it was a Billboard #1 hit for four weeks in 1972, and in 1973, Nilsson won a Grammy for the song. As I was thinking about writing this piece, I was having trouble naming other Nilsson songs, and research reminded me of his cover of Fred Neil’s “Everybody’s Talking,” and the goofy “Coconut.” And, coincidentally, in the car the other night, WFUV played “Me and My Arrow,” which I recognized, but didn’t know was by Nilsson. The guy had a pretty prolific career, as a performer and songwriter, and spent some time, often drunk, with John Lennon, in the early-mid 1970s, before dying of heart failure in 1994 at the age of 52. Another thing that I didn’t know until fairly recently was that the version of “Without You” that I listened to with my father was a cover of a Badfinger song. Co-written by Pete Ham and Tom Evans of the band, it merged two songs that they had separately worked on. The original is pretty uninspiring, and was not released as a single in the US or UK. But Nilsson’s hit version gave the song new life, and it has been covered more than 180 times, most commercially successfully (and with even more over the top emotion and unnecessary vocal flourishes) by Mariah Carey, and in other languages, including Cambodian. Sadly, the success of “Without You,” led to tragedy. Pete Ham committed suicide in 1975, after it appeared that a business manager had defrauded the band and its label, leaving the members penniless. Tom Evans subsequently fought with guitarist Joey Molland over rights to perform as “Badfinger,” and specifically about the royalties earned from “Without You.” Following one heated argument, Evans hanged himself on November 19, 1983.